I am always happy to answer any questions you have. Please don't ever hesitate to ask if you aren't sure of what I mean in my instructions. Sometimes it is hard to know if my wording makes sense to anybody besides me. You can always email me at happyquiltingmelissa (at) gmail (dot) com and I will get you an answer as soon as I can. Okay . . . Now some Notes on the Fabric Requirements!! Also, If you want to quilt-a-long, but want to do a smaller size that is just fabulous. Please don't feel that you have to do the Queen size in order to participate. You will just want to adjust your fabric needs based on the size you are doing. The Queen Size is made of 36 12" finished blocks in a 6 x 6 grid and then borders. So from that you will want to decide how many blocks and what grid you want them in and if you want borders then estimate your fabric needs from the original requirements. If you have any questions or need help calculating fabric requirements for your particular chosen size please do not hesitate to email me. I would be happy to help you figure them out. I will be giving the fabric requirements followed by the Fabric Choices that I will be using from the Joel Dewberry Heirloom Line :) Then I will release the Coupon Code for your discount at Fat Quarter Shop!! FABRIC REQUIREMENTS FOR A 84 x 84 STARS Quilt! 1 Fat Quarter Bundle in the Ruby Colorway. 5 1/2 Yards of Kona White. Thank you to Kimberly and the Fat Quarter Shop for sponsoring this STARS Quilt-A-Long!!! Kimberly, has graciously offered a discount of 20% off ALL HEIRLOOM FABRICS!!!!!! Yes, that includes all the Heirloom FQB's as well as yardage that you would need for borders, backing, and bindings :) Yippee Skippee!!!!! 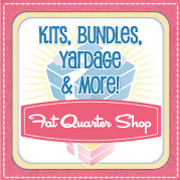 To get your 20% off, simply use the coupon code HEIRLOOM when checking out :) So get on over to the Fat Quarter Shop and pick out your favorite color-way and coordinating prints and save big!!! Have a Happy Quilting Day!!!!! Melissa....thank you so much for this quilt a-long, I look forward to having fun with everyone! -- read fabric requirements. check. -- ordered my fabric needs & desires. check. -- will be ready on Monday to make it happen. check. No more scraps! I'm hoping to make this quilt completely out of scraps (except maybe the border but who knows, maybe I'll make that scrappy too. goodness knows I have enough) so I can clear some space in my room. Yes, my fabric stash is in my room. *sigh* That's what happens when you have kids, you have to clear out your "mommy space" for them. Help me with my logic here. I don't want that large of a quilt - I'm thinking 16 squares instead of 36 (so 4x4 grid instead of 6x6 grid). The area of my quilt (not counting borders) will be 44% the area of your quilt. I'll use a FQ bundle anyway and just have more scraps than you do. But for the white, I'm thinking I only need half what you need. Does that make sense? For borders I think I need 2/3 what you need (if I want my borders as thick as yours, but I'll probably scale back). And for backing - my quilt will probably finish around 5' by 5' which is about 50% of the area of your finished quilt, so I'll get about 50% what you require. Anybody see flaws in my logic? This sounds like so much fun!! I'm looking forward to making this into a lovely scrappy tabletopper! I think I'll make nine star blocks? I love Ruby....oh, it's calling my name. And there's a discount. Gotta go and look at FQS!! It's my sister's fault (Snoodles!) I hopped over here from her post on OleFrogEyes Facebook page and wow! I love this. P.S. I love FQS - everything about them is stellar! The selection, the service and the tempting discounts! Wooohooo! I love a good quilt Along, and this one is no exception Melissa! Just been to FQS and ordered my fabric, so thank you and the ladies of FQS for the discount, realistically it meant I effectively got my international shipping free! Gotta love those lovely ladies for such a great service! Oh, this is so gorgeous, but I don't think I'll have time this go-round. Too many unfinished projects. Hopefully the next one! Button added and fabric picked!! Thank you Melissa for hosting this QAL!! This looks like so much fun! I have the fabric in the citrine colorway, so that's what I'll be using. I've got my button up and think this is going to be fun! ...but it's nice to have one all the same! I'd love to join in with the QAL!